Burt’s Bees’ classic lip balm might get all the buzz but you can actually make this hydrating concoction from the comfort of your own home – just heat together 1 part beeswax with 1 part coconut oil and a few drops of Vitamin E oil. The more oil you add, the softer the balm will be and you can use the mix as a hand salve or body butter. Beeswax has the amazing ability to be moisturising yet waterproof at the same time. To waterproof leather or canvas shoes, simply rub beeswax all over the material then heat it with a hair dryer until the waxy layer melts. Easy! To add protection and longevity to metal objects, coat items such as hand tools or shovels with a layer of beeswax to prevent rust. Rubbing the wax on nails and screws can keep them from rusting too. Beeswax can also be used to help copper from tarnishing. Melt ⅓ pound of beeswax with 32 ounces of turpentine and brush it onto the copper before buffing with a towel. Rub beeswax on windows or wooden drawers that have a tendency stick for easier movement. For example, if you have an old dresser with drawers that are difficult to open and close, try rubbing a thin layer of beeswax onto the rails for smoother sliding. Help protect wooden furniture, spoons or cutting boards by melting a half-teaspoon of beeswax to a cup of mineral oil then apply the blend to wood with a soft cloth. Along with wood, you can use beeswax to polish granite or sealed concrete countertops for a natural shine and lasting protection. Just run melted wax onto the counter, let cool and then wipe off with a cloth. Melt equal parts of beeswax with one of our other favourite products, coconut oil, (read our ode to the magical oil here) for a homemade mustache wax to stay looking sharp. No beard or mustache? No problem – the mixture can also be used on the ends of dry hair as an intense moisturising treatment. 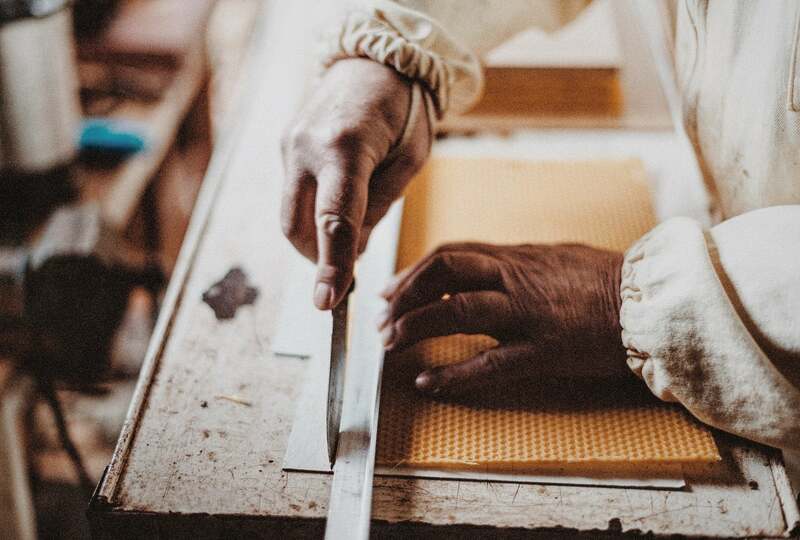 While we may still be partial to using beeswax for our beeswax wraps, the different uses for beeswax are incredible and, with no chemicals or toxins, help make your home a safer and healthier one. Still not convinced that beeswax is truly the bee’s knees? These nine amazing facts all about beeswax will seal the deal. HI Tricia, At the moment, SuperBee is only available online, but we are working on getting them into stores soon. Have a great day!